The sun did not shine. It was too wet to play. So we sat in the house all that cold, cold, wet day. In the popular Dr. Seuss story of The Cat and the Hat, the mother actually leaves the kids behind. We never find out exactly what she’s been up to. Only the hint of a sassy red dress and black high-heeled pump are shown as everyone scrambles to put the house back in order before her return. She is blissfully oblivious to the cat’s enlistment of Thing 1 and Thing 2 to entertain the children who are nearly bored to death. Enter last Sunday afternoon. With one child recovering from pneumonia, it was essential to keep the quiet-time activities going all day long. Not an easy feat with comments like, “This is the most baddest day ever!” and “Mommy, you don’t have time for us!” After having family in town for three days, there were plenty neglected household duties to take care of. Would I be able to read each of the 33-page manuals for our new washer and dryer to do eight impending loads of laundry? What about some yoga? Would I have energy to make a nice dinner (later in the story, we find out not really)? While keeping kids busy may not be rocket science, it does take an initial investment of time in small increments throughout the day to keep them on a happy track. I have to constantly remind myself of this. 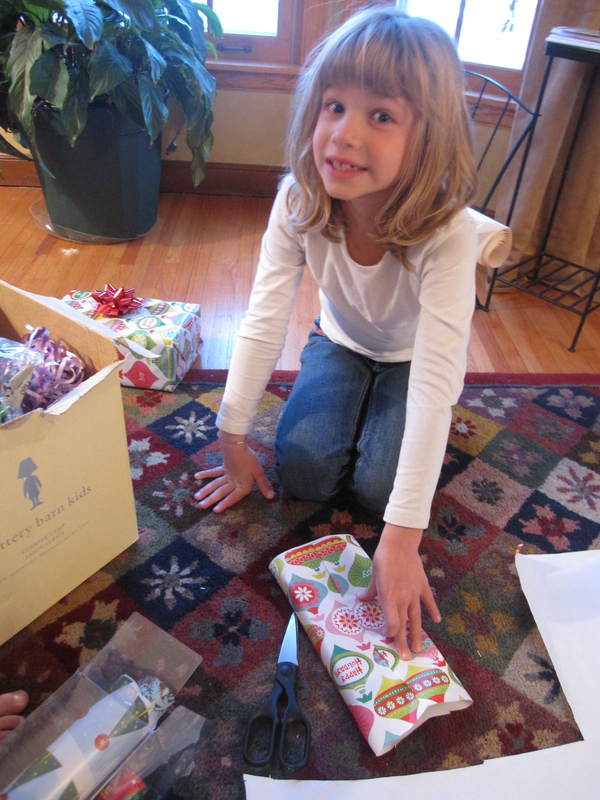 It turns out that the solution to my daughter’s melt-down early in the day was teaching her how to wrap presents. Really? This we can do. Five different sized boxes later and remnants of wrapping paper from ten Christmases ago, we measured, cut, taped, creased and attached bows. This skill will come in very handy in a few weeks. After this activity, I began to disallow my high-bar for crafts to set in and just went with it. I challenged them to make a snowman mommy-style. Never outside in the cold, rather the indoor type that never melts. To set the tone for the care they were to take with its construction, we determined that the finished paper snowman would be taped to each of their doors. They spent some time in the kitchen deciding which pots and pans would work as tracers for the three snowman circles. With tracing and cutting complete, they colored and designed while I got in 17 minutes of uninterrupted yoga. When they joined me at the 17 minute mark, it threw off my namaste. I insisted they get out their mat and join in. Basically they just wanted to perfect child pose and give me the occasional helpful spot for positions like Ardha Chandrasana. And I do. I really like these creative children who actually can just delight and surprise themselves with the things they can do. As a side note: while mommy was out on Saturday, husband and son did find their own time to create. 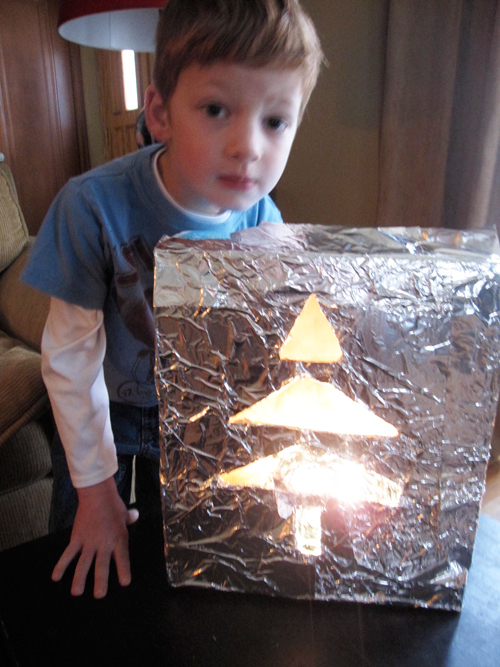 Aluminum foil, a box and a string of lights, was a welcome Christmas tree outdoor lantern to come home to. I for one am thankful for the opportunity Thanksgiving affords to do nothing. We have always traveled for the holiday, so I’ve never made a turkey. At the most, I’ve mashed potatoes. I’m thinking that this year, I’ve taken it too far. For future I need to learn the balance of holiday lack of activity and productivity. Per the usual for me, all of the obligations of daily life make going from the fast-paced extreme to down time a challenge. If not properly done, it’s easy to loose respect for yourself. This Thanksgiving was no exception. As we headed from Minnesota into Wisconsin to my mother-in-law’s house, earlier than planned due to the impending snowstorm, I felt lucky that Over the River and Through the Woods to Grandmother’s House We Go nearly applied to us minus the horse and the sleigh. We had super planning efforts prior to leaving – we cleaned the house, made a dessert to bring, bought presents for our cousin’s birthday and even picked up our poinsettias to deliver as gifts. Martha would have been proud. The anticipation of relaxing by the fire and doing absolutely nothing was too much to overcome. 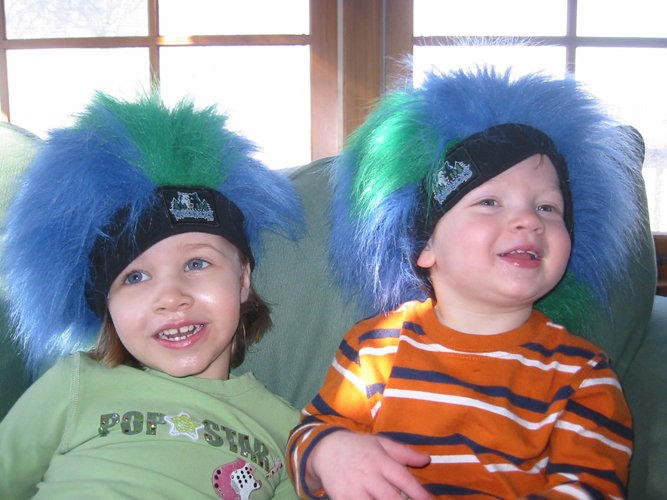 By the time we arrived in Wisconsin, I was sufficiently wound down and the kids were overly wound up. Calvin was not feeling well, even though the doctor had just checked him out and diagnosed him with a cold. That weighed on me our time away, assuming the worst was yet to come due to his history of ear infections and pneumonia. I was in a relaxed state, yet edgy about what to do for him. Too much time to ponder and fear the worst. The blizzard and pharmacy close time of 5:00p.m. Wednesday spurred us into action. I called a friend who is also a PA and asked her to quickly call in a prescription to have on hand if he got worse. With antibiotics as the back-up plan, we enjoyed a fire and leisurely dinner later that evening, where I did nothing to help. What would the night be like? Sleepless. Coughing. We decided to give him the medication around 8:30a.m. Thursday, then Calvin and I both went to sleep again, while Grandma single-handedly prepared the TG feast. I woke up groggy at 11:30a.m. – how did I let that happen? Contributions to date: zero. Calvin seemed much better after his long nap and we were all able to enjoy what Calvin insisted on calling Thanksgiving Lunch (after all it was 12:30p.m.) What would happen to dinner if we called 12:30’s meal lunch? Grandma said it was too big of a hoopla to call it TG Lunch. As if I had not slacked off enough, I needed yet another nap after the meal. In hindsight, a little yoga or exercise of any sort might have been a better route. When I finally did rise, I turned to a Wild Cherry Pepsi. It sparked a slight start in my energy level. The kids ran circles around me. It was time for games. They learned some new dice games with poker chips that helped with math, left v right and perhaps fueled a new interest in gambling. It was now time to eat again. New-York Style Marbled Cheesecake. We made this, so I had the honor of cutting and serving it. My contribution for the holiday. Then more sitting and visiting. The open floor plan at Grandmas where every activity takes place in the greatroom of sorts, meant that I seldom had to move or move very far at that. I could also conveniently call out to the kids — rarely would have to go actually find them to check on them or talk to them. The lack of activity continued throughout the evening. If I wasn’t going to physically challenge myself to anything, maybe a mental challenge was the answer. The grown-ups played Password to challenge our inner thesauruses. With only one word as a clue, the guesser would have to try to guess the word. Unless two players are on the same wavelength, it takes 3-6 clues together to guess. This at least gave my life some purpose. Even then, it was all I could do to get up off the chair and make it to bed. Surprisingly, I was quick to fall asleep. Coughing from Calvin still ensued, but I was convinced he was on the mend. The morning came. After aebleskivers for breakfast (tasty little spherical pancakes/ a Danish thing), we were on our way home. I am now off to exercise in hopes of gaining back some self-respect and ponder what I might do differently next time. I’m thinking I may just have to host Thanksgiving at my house to bring me out of my non-contributor state. When I envisioned discovering super healthy recipes my kids would love, bacon was far from the mix. However, there is a whole host of recipes and underground culture of bacon-lovers. Think bumper stickers: Everything is Better with Bacon. I was curious about that theory. I was also recently inspired by Bravo’s Top Chef: Just Desserts (admittedly I wondered how they were going to pull off a Bravo show of just desserts) and their quest to discover the sweet and savory. So when I came across the Peanut Butter Chocolate Bacon Cupcake, I knew I had my candidate. 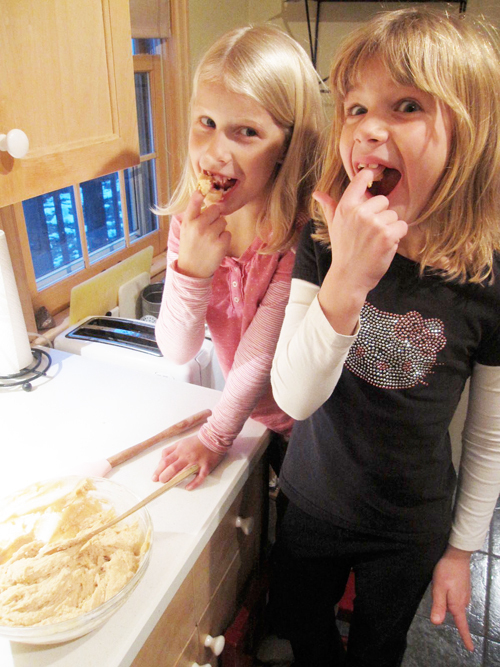 When I pitched the recipe idea to the kids (ages 5, 7 and 7), I certainly got some inquisitive looks. This coming from Calvin who not so long ago thought a tasty steamer-type drink was adding chocolate syrup and ketchup to milk. 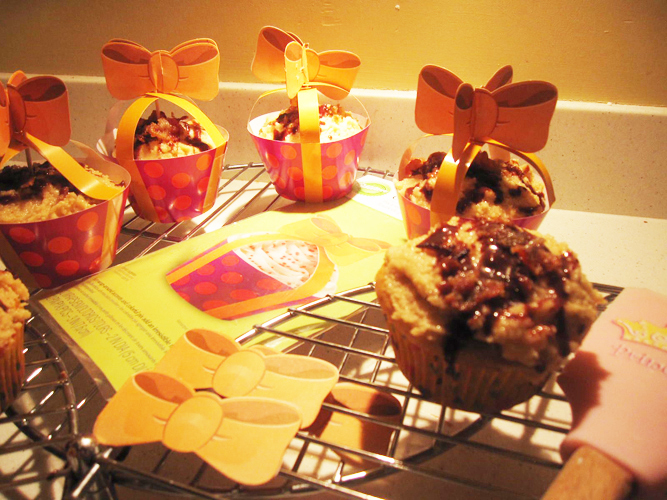 Wait, so if we like bacon and PB and chocolate, we should in theory like the combo in a cupcake. They agreed that there has never been a cupcake they’ve tried and not liked. I had buy in. Ava made the list, I shopped on my own and we began with me, my two kids and my daughter’s friend, who was totally up for the task. Lots of details in the recipe and with only a 2-hour playdate, we had a lot to accomplish. The girls came and went out of the kitchen. Later I read her “Weekend News” (Monday’s school assignment) to learn that when they retreated to her room and closed the door, they were playing fashone motles. She also noted that it didn’t go so well. My son thought it pretty cool that they left so he could take over. When they returned, he bossed them around. They were mostly okay with that. They took turns measuring (oil, milk), pouring, cracking the eggs and stirring. They tasted everything, as a good chef should. They all disappeared during the baking time, while I made what seemed like an enormous amount of frosting (I still have 3 cups leftover and it resembles the consistency of cookie dough) and way more than necessary chocolate drizzle. What went wrong quantity-wise? Couldn’t say. Will chalk it up to lost in translation. Luckily frosting and drizzle are forgiving. I let the kids frost the cupcakes, exercising patience not to step in and redo. The last step was creating the polka-dot wrap and bowtie tops so four of the best looking cakes could be sent home safely with Ava’s friend. Even though the insert slots for the base didn’t hold and had to be taped over, the concept was fun and the toothpick bows and ribbons assembly was easy for them. The top little chefs fared well and we have all had our fair share of bacon. If you want for more, see Bacon Gets Its Just Desserts. And if you still think the PBCB Cupcakes sound unappealing, just note that I used organic bacon and I halved the bacon in the mix. The rest of the bacon, unapologetically, is coated in brown sugar and sprinkled on top. And the final pitfall: not only are they super appropriate for dessert, but with bacon, they will even tempt you at breakfast. 3.5 of out 5 stars – good on originality, not so heart-healthy. Lost points for frosting consistency were made up for in decor. When I learned my husband was going to be out of town around the world for one week, I initially went into panic mode. But I had handled this type of situation swimmingly before, I could do it again. An opportunity. Saturday 13: It began with a list that even before he was gone I was working on. It started with appliances. It might date me to say how insanely excited the purchase of new appliances – washer, dryer, microwave and vacuum – made me, but just last night a co-worker confirmed that yes, it is indeed thrilling. The adrenaline rush was heightened by the wild cherry red (to which my mom acknowledged with an ohhh, which meant she thought I would probably regret this color choice later) and the blizzard en route to the St. Paul Warners’ Stellian Warehouse for their Extreme Sale. All worth it as the anticipation of waiting for delivery all week has actually put a smile on my face everyday. That started on Saturday the 13th and set the tone for the week. Monday 15: He left early Monday a.m. The kids had a talking-to about how I’m extra specially counting on them to do their part this week. The chore charts were taped up on the wall in anticipation of the extreme efficiency with which we were going to operate. I’m happy to report that the 6:59a.m. bus was made 4 of 5 days. It’s only a short block’s walk to the stop with my 7-yr-old while my 5-yr-old explores his independence for 2-3 minutes at home. When asked, he says he just laid on the couch during that time. I lock the door, of course. Monday night, after fortuitously finding that USABaby had extended their weekend sale through Monday (due to the blizzard), it was finally the moment for Calvin’s bed frame and dresser purchase. Without realizing it, I am on a color theme. I select Chili Pepper Red, again an ohhh from my Mom (just wait til I save up for the tangerine night stand). Calvin wondered what was wrong with his bed on the floor. How would he organize his clothes? Custom orders are a 6-8 week wait, so in theory I will be smiling until January about that purchase. It’s only Monday night and just look how much (damage) we have done. Tuesday 16: Tonight was a visit to my friend Steph’s house to meet her new baby and give the kids (her son is 4) a chance to play. She’s lived in St. Paul for 5 years and lamely, I had never been to her house. This also is an amazingly good feeling to have time out of discussions with a group of girls at a restaurant/bar to reconnect not only with her, but get to know her kids. I fed Baby Logan her bottle, to which she lost most of its contents. My kids, wide-eyed wondered how I would handle the messy situation. We talked about it later – how not to panic. Calvin noted that we wouldn’t want to imply that we didn’t like her baby. Wednesday 17: Today was a social media seminar and the launch of this blog which kept me up til midnight. Thursday 18: A trip to the dentist. We didn’t actually see the dentist, mind you. We were late so had to reschedule. We were not going to let this get us down (actually my son was overjoyed). Solution: Southdale. I got my much needed make-up while the kids tested lotions at Aveda. They got their xmas outfits (you know the usual deals you get 25% off and an additional deal the store clerk whispers that she’ll give you on top of that – the norm these days). And we topped everything off with Megamind. More on this later under “Y” for Yeses and Recommendations. I will say I found humor in the off pronunciations of words like Metrocity (Met TRA city; think monstrosity) and melancholy (Mel LAN choly), reminiscent of my Dad’s southmore for sophomore and IT ly for Italy. Friday 19: Finally Friday. The annual awards celebration for work in the eve. Dual babysitters and arrangements. Uncle Pauly did the first shift and one of their regular babysitters showed up with her cousin for the later shift. Home at midnight and a quick check of my email yielded good news that helped me sleep soundly – the husband was going to be home a day early, for lunch on Saturday. We did well with our independence. There is a sense of accomplishment. No illnesses, no regrets. Next time, I’m going with him. Check. 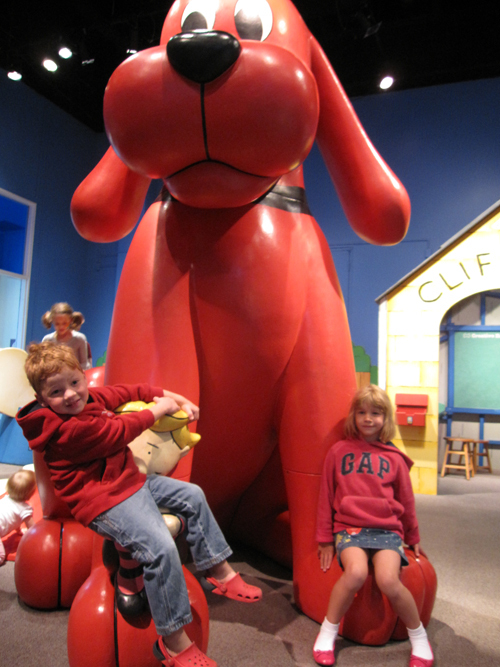 When Clifford the Big Red Dog came to the Children’s Museum in Saint Paul last fall, we did too. We called the day kids vacay and did mostly stuff they wanted to do. Truth is, I had a great time. I planned a bit in advance – checking museum times, kids menus and movie times and mapping out a route, leaving plenty of time in between for lingering between the activities. It rained that day, making the line-up even more inviting. 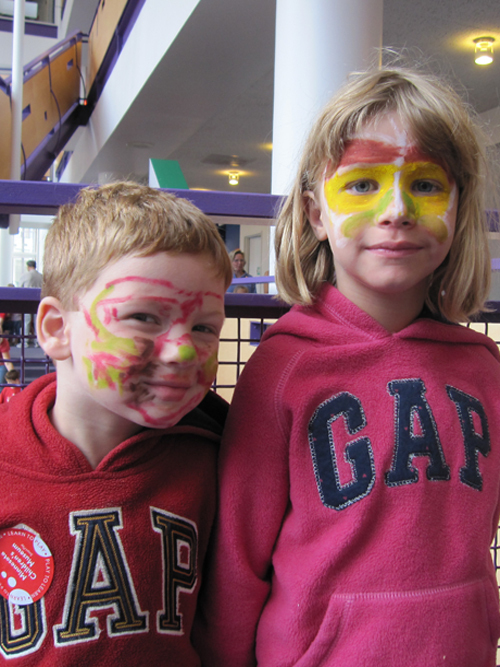 We were at the Children’s Museum around 10a.m. We checked out the statuesque Clifford in his play area (in the rotating exhibits area) and listened suspciously to the talking and walking dog version as he read a book about himself to the kids. Most of the 2 and 3 year-olds were eating this up. Calvin, my 5-yr-old, was on to him, but played along just the same. There’s usually a line when face painting is involved. Why not today, I wondered. It was paint your own face day. They used mirrors. Ava did really well with this, Calvin not so much. Then, we walked through the water bubbles areas and soon the kids were starved, so I convinced them to split something to hold them until the next stop: lunch. We left the museum 12:30 or so with Plan A for Salut on Grand and Plan B for Salut in Edina, near the movie theater. I think it’s important in the middle of a go-go day to have a chance to unwind midway. We are so centrally located, I typically come home between outings and keep them to 1.5 hours. Today was a bit different, seeing as though it was vacay. Plan A led us to Salut on Grand. They have a basic kids menu that’s very reasonably priced. 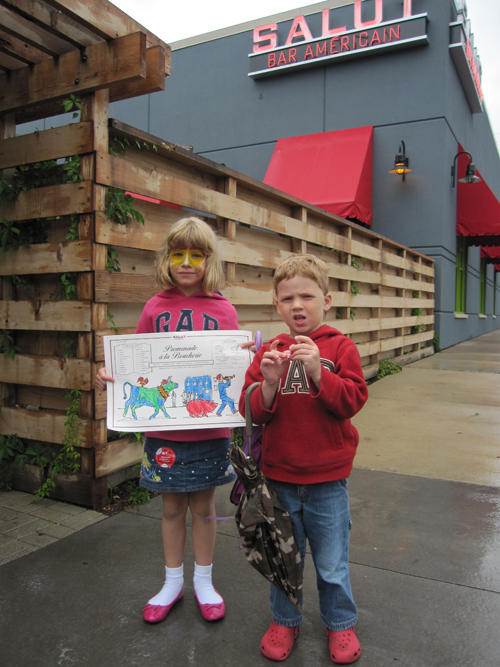 It’s not on their site, but it’s $3 for pizza or pasta, bread and lemonade per kid. I like it because they use guyere vs. cheddar, just to say not all mac-n-cheese is the same. The kiddie coloring menu is substantial. We might have lingered a bit too long at Salut, but I allowed us that. It was really raining at this point and traffic heading back West on 94 wasn’t as smooth. The kids were whining and a bit tired out. I wasn’t expecting Ponyo to be stellar and coming into the movie a bit late left all of us with a lot of questions. I made something up about it that proved to be true and satisfied their questions. Biggest, most important take-away was the catchy tune, Ponyo: A Fishy in the Sea. We hummed this all the way home and agreed that it was indeed a fun vacay day. All in all, a 4 out of 5 star outing. Points off for me due to more money spent than intended. Museum is about $9 each (get a membership already!) and the matinee was $7 for kids and $9 for adults.